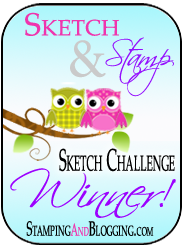 Welcome Stampers to The Happy Stampers weekly blog hop. Each Thursday our group will be sharing a project with you. Some hops are sketch challenges and some are color challenges. This week was a color challenge. We used Old Olive, Rich Razzelberry and Soft Suede. I hope you enjoy the cards today. It will be fun to see how each person used the color combination. Enjoy each blog as you hop to each post. Today I received my inspiration for the color challenge using the beautiful DSP from Stampin Up called ” Into The Woods” It was perfect because it fit right into the color pallet of our challenge using, Old Olive, Rich Razzelberry and Soft Suede. The leaves are Old Olive stamped with Mossy Meadow and Rich Razzelberry stamped in Blackberry bliss. I added a white bakers twine bow for added dimension. After I stamped the banner with the ink to rubber technique using my ink pens in Old Olive and Rich Razzelberry, I added a gold button and more white bakers twine. Notice the touch of gold on the leaves, a bit of Dazzling Details finished the detail on the leaves and ties the gold to the rest of the card. I have to add a touch to the inside of the card, it is such a surprise when you open a card and the design is carried throughout the project. Stamping the envelope is so fun too. It gives the person getting the card a sneak peek as to what might be inside. I love that element of surprise. If you need supplies to make this card you can order them through my Stampin Up website by clicking the “shop with me button” You can also contact me and I would be happy to help you out too. Here is the list of the other participants. Be sure to visit them and see what they created with this weeks color challenge blog hop. Just click the button which will direct you to the next blog or click each name to direct you to each individual post. Leave a comment too, we would love to hear from you. This entry was posted in Acorny Thank You, Fall, Uncategorized. absolutely beautiful card Kristi, love everything about it. Thanks Sandi, so sorry for the delay this morning. Oh, that’s awesome Kristi! Love the design, your layering is fantastic! The gold adds the perfect touch. Thank you Amy, it was a fun card to do and the color combo was perfect with that DSP. Thanks Mary, it was a fun card to do. I love your card. All of the details are perfect! Your white card base really makes all of the other colors pop! Beautiful! Thank you Jari. I look forward to more hops. This is a WOW creation!!! LOVE all the different elemnets here. Hugs from Shelagh. Thank you Shelagh, sorry about the mix up today. Thank You Jeanne, I loved the color challenge. Thank you for leaving a comment and visiting my blog. I will be doing this each week so stay tuned. I really like your card! Love how you stamped the inside of the card also!